Our mission as a foundation is to ensure the continuing success of the USC Orthodontic Program, as the premier orthodontic program in the world. Budget restraints and priorities greatly affect the ability of universities and dental schools to provide and maintain quality orthodontic programs. Adequate funding is critical to providing the highest level of education and to attract the best students, faculty and staff. 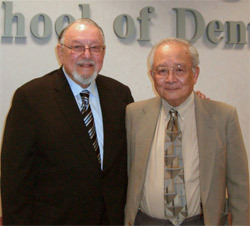 Our response to meet the needs of the USC Orthodontic Department is to create The Harry L. Dougherty and Keith Tanaka Orthodontic Foundation, Inc. This Foundation is patterned after other very successful orthodontic foundations, which have supported programs such as St. Louis University, the University of North Carolina and the Virginia Commonwealth University. Disseminate scientific information through scientific meetings. Establish endowments for recruitment and retention of outstanding faculty. Promote education through technological advances, scientific research, and cutting edge clinical techniques. Provide funding for fellowships, scholarships. and support for orthodontic graduate students. Purchase equipment and provide the technological advances for orthodontic research and teaching.